Collards or Collard greens (Brassica oleracea - Acephala Group) are one of the non-head forming of leaf vegetables in the family Brassicaceae. They are usually grown for their large, dark-colored, edible leaves, and also as an ornamental plant. The plants are grown for their large, dark-colored, edible leaves and as a garden ornamental, mainly in Brazil, Portugal, the southern United States, many parts of Africa, Montenegro, Bosnia and Herzegovina, southern Croatia, northern Spain and in northern India. They are classified in the same cultivar group as kale and spring greens, to which they are genetically similar. 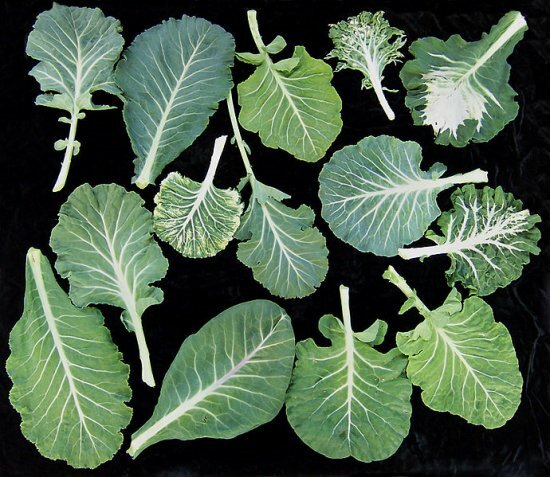 The name "collard" is a corrupted form of the word "colewort" (the wild cabbage plant). Collard greens are known variously as couve (Brazil), couve-galega (Portugal), kovi or kobi (spanish-speaking countries), haak (Kashmir), and sukuma wiki (East Africa). The group name Acephala is derived from Greek word meaning 'without a head'. Georgia Southern, Morris Heading, Butter Collard (or couve-manteiga), and couve tronchuda are the popular collard greens. Collard greens have upright stalk, growing up to 60 cm tall, and look similar to kale, and are available year-round. The leaves are dark bluish green, smooth in texture, and relatively broad, with a slightly bitter taste. The leaves are tastier and more nutritious in the cold months, after the first frost. The leaves should be picked before they reach their maximum size. However, the flavor is not depended on the age of the leaves. The flavor and texture of the leaves are depended on the cultivar. Collard greens are a common vegetable in the southern US cuisines, often prepared together with other similar green leaf vegetables. The leaves can also be added to meat dishes, such as smoked and salted meats, together with onions, salt, vinegar, and pepper. In Portuguese and Brazilian cuisine, collard greens are a common side dish in fish and meat dishes, especially feijoada, a popular pork and bean-style soup. In Kashmir, both the leaves and the roots are eaten, and are used in almost every meal. The roots and leaves are cooked together or separately. They are used in soups, or cooked along with meat, fish or cheese. The leaves and the roots are fermented to form haak-e-aanchaar, a popular pickle. Collard greens has cholesterol-lowering ability, and are rich in vitamin A, C and K, and a good source of manganese, folate, calcium, potassium, and dietary fiber. Popular cultivars of collard greens include 'Georgia Southern', 'Morris Heading', 'Butter Collard' (or couve manteiga), and couve tronchuda.